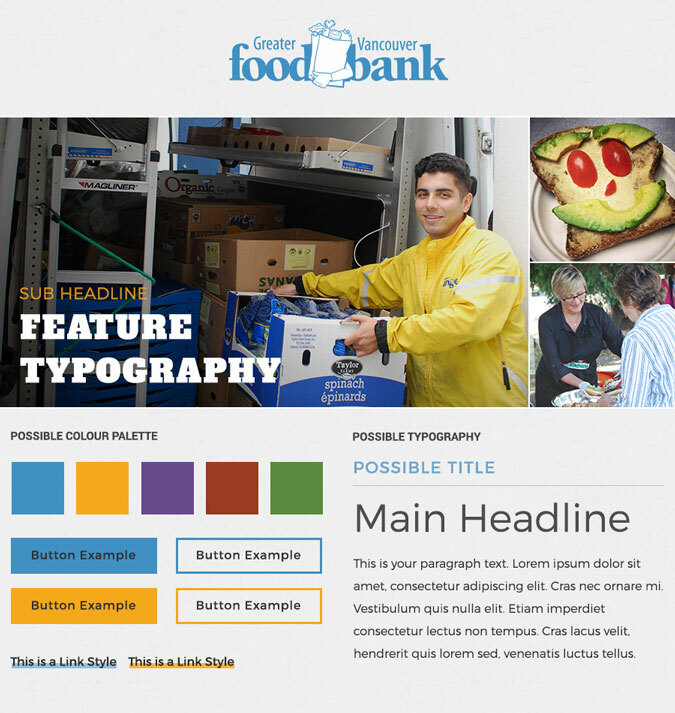 The Greater Vancouver Food Bank came to Forge and Smith looking for a completely refreshed web experience. The goal of the site was to reflect their new brand structure and tell their story better. The non-profit is well known throughout Lower Mainland British Columbia. 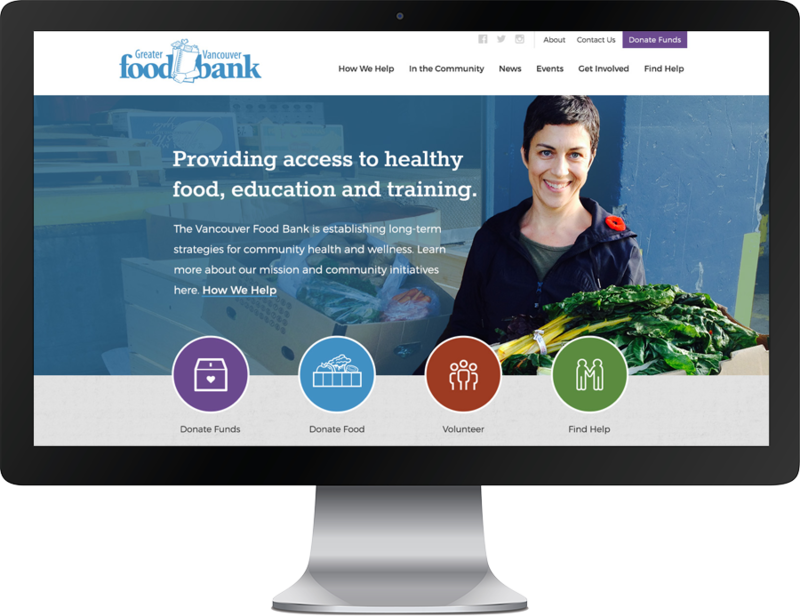 After folding several separate programs into the Food Bank brand they needed their website to reflect this – for donors, the food industry and those needing the services. With only twelve weeks before full site launch the project required a quick turnaround to be ready for the busy end-of-year donation season. To kick off the project I conducted a brief brand discovery session. With the limited timeline I was very grateful that the client was able to meet face-to-face. From the meeting I produced some style tile concepts to open up discussion on a direction for the visual side of the site. The style tile gave a flavour of how the new identity could translate onto the web. The colour palette and typefaces were defined by the branding guidelines, but the rest was open to interpretation. The typography was kept clean and clear inline with the brand style, but allowed for some bold feature headlines. Bright, colourful and fun community-related photography direction was curated for use in the tile, and eventually into the site. Through use of large feature photography and brand colours the homepage was visually appealing while balancing the charity requirements. Legible typography with a clear hierarchy was used to maintain visual interest while displaying the content. The client had access to a selection of high-quality photographs, but not enough to support individual images for each event and blog posts they publish. As a solution I incorporated photography that was not linked to the specific events or posts. This allowed them to showcase their best photography on the homepage at all times. 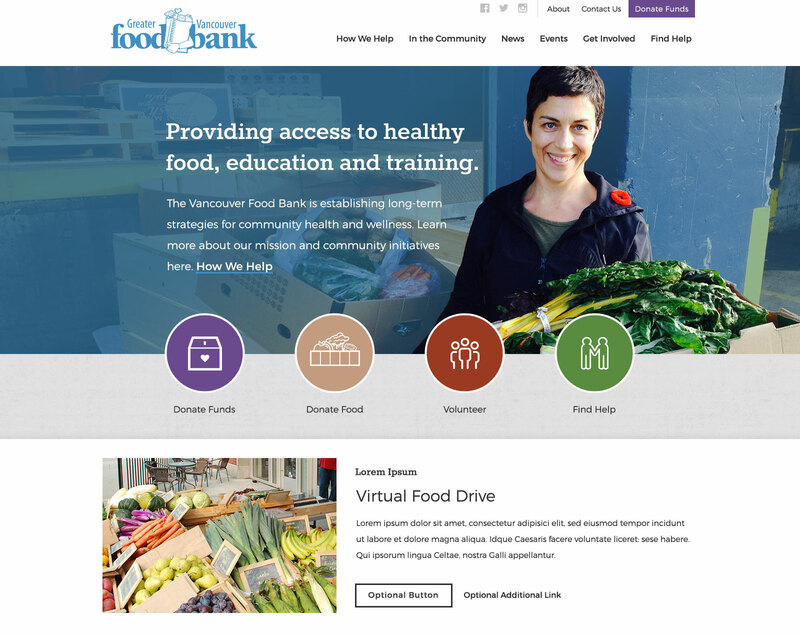 Greater Vancouver Food Bank has a website to tell their story, showcase their great photography and share their community involvement.